Sizzling lamb chops in a skillet creates a beautiful crust that’s loaded with flavor! Marinating in garlic, rosemary, thyme, and olive oil infuses herbaceous notes and tenderizes the meat for a fast and stunning meal. Cooking lamb doesn’t need to be an intimidating feat, nor should you wait for a fancy occasion to enjoy. Learning how to cook lamb chops is actually quite easy! In my opinion, the well-marbled and robust flavors are enhanced when pan-frying on the stove top. A simple herb and garlic marinade makes each bite burst with rustic flavor, in a short period of time. After that, this particular cut just needs a few minutes to sear in a hot pan. The fat bastes the outside of the meat as it renders, keeping it super juicy, tender, and rich in taste. These chops have a major wow-factor with little effort. Marinate with garlic, herb, and olive oil paste. Pan sear until browned on the surface. Flip and cook until the desired doneness is reached. Rest lamb chops for 10 minutes before serving. Lamb chops are typically bone-in meat chops, cut from the shoulder, loin, sirloin, or rib of the animal. These are all loaded with flavor, tender, and cook very quickly, typically under 10 minutes depending on thickness. 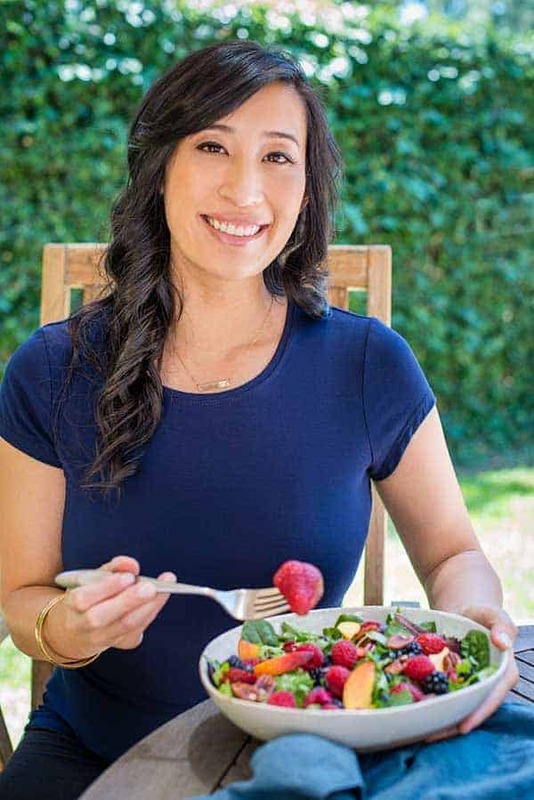 They are also much more affordable than a rack of lamb, and simpler to prepare if you are looking for a more casual meal. The shoulder portion, used in this recipe, cooks very quickly and can be purchased as the blade or arm chops. The loin chop will have a “T” shaped bone for an attractive appearance. Sirloin chops are very meaty and cut from the leg with a round bone in the meat. Lamb is a domestically raised sheep that’s under the age of one year. This provides very tender meat with a very subtle gaminess compared to older sheep. The richness comes from the fat on the animal, so look for even distribution in the meat with some surrounding the edges of the chop. What’s the benefit of marinating? Marinating the meat before cooking adds layers of flavor on the surface, and helps to further tenderize it with salt. Make sure to generously season with salt and pepper first, then spread on the herb paste. This recipe uses rosemary, thyme, parsley, and extra-virgin olive oil. Adding in some fat like olive oil dissolves the fat-soluble flavor molecules in the aromatics to diffuse it more efficiently on the lamb. The recipe doesn’t use any acids in the marinade, so it’s safe to prepare and refrigerate for hours without the risk of becoming mushy in texture. What herbs and spices go well with lamb? Lamb chops are very robust in flavor, so it can stand up to strong earthy herbs and spices. Other herbs that work well are chopped oregano, basil, sage, or mint. Spices like coriander, cumin, garlic powder, onion powder, cayenne, chili powder, mustard powder, or paprika will add a nice punch. Lamb chops range in thickness from ½ to 1-inch in size depending on the butcher. The tender meat needs brief high heat cooking like a steak, and it’s best to eat at medium-rare to medium temperatures. Target 125°F (51°C) for medium-rare, or 135°F (57°C) for medium. Make sure to rest the meat for at least 10 minutes to allow for carryover cooking and hitting just the right doneness temperature. Overcooked or well-done lamb will be dry and stringy. Resting after cooking maximizes the juiciness. Meat is composed of 75% moisture, and the rest is protein and fat. The proteins that hold the water in the flesh contract when cooked which squeezes out moisture. However, some can be reabsorbed during resting as the proteins relax. 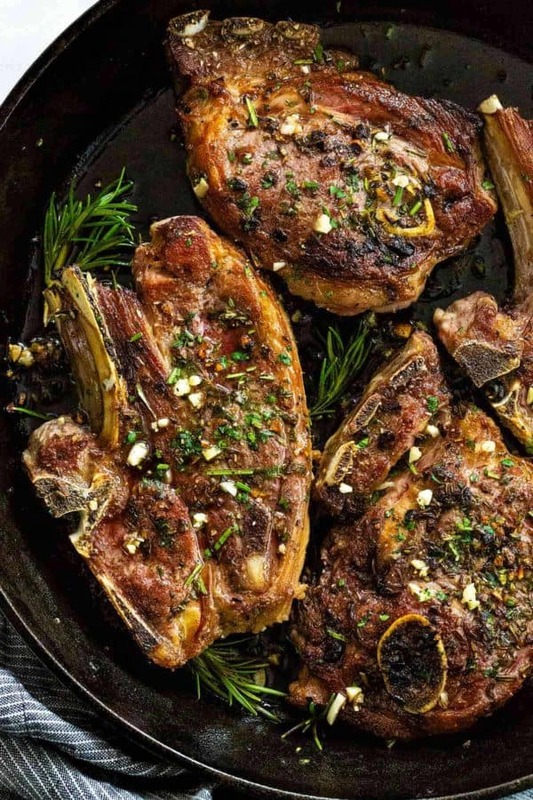 Lamb chops marinated in garlic, rosemary, thyme, and olive oil then pan-seared on the stovetop to create a wonderfully flavorful crust. Season both sides of the lamb chop generously with salt and pepper. Combine garlic, rosemary, thyme, and 2 tablespoons olive oil in a small bowl. Rub the paste on both sides of the lamb chops and let them marinate for at least 30 minutes at room temperature. Heat a large 12-inch frying pan over medium-high heat. Add 2 tablespoons olive oil, once hot add in the lamb chops. Sear until the surface is browned, about 2 to 3 minutes. Flip and cook until meat reaches an internal temperature of 125°F (51°C) medium rare, or 135°F (57°C) for medium, about 3 to 4 minutes. Marinate in the lamb chops in the refrigerator if not cooking within 1 hour. The chops can be marinated for up to 24 hours. 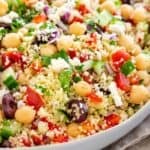 Very tasty recipe! The combination of ingredients sounds good! Made these chops and pan sauce for our Christmas dinner. SOOO good. Will definitely be saving this recipe! 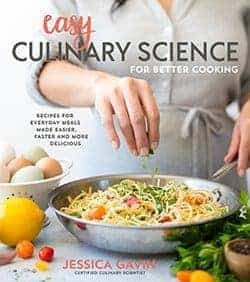 Hi Jessica, this recipe looks delish! Sadly, we live in a very small, rural area, and lamb isn’t always available and when it is it’s pretty pricey. Is there another meat option that would work with this marinade without over-powering it? Hi Jackie- Flank or skirt steak would work nicely or even pork chops.